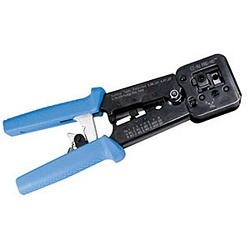 This EZ-RJ tool quickly crimps and cut the wires of a EZ-RJ45 compatible connectors in one easy simple operation! Perfect for working with shielded cables that are tough to terminate due to larger wire gauges, the EZ-RJPRO HD crimp tool gives you a ratcheted, high-leverage and stable platform for consistent terminations. Compatible with all RJ45, RJ12 and RJ11 modular plug connectors (except AMP), the EZ-RJPRO HD does a particularly great job with the EZ-RJ45 and EZ-RJ11/12 connectors. The zero-flex frame minimizes torque loss while the steel die head assembly provides 360 degrees of connector support during the crimp cycle.